The legalization trend continued on Tuesday. Michigan legalized recreational marijuana, with Utah and Missouri legalizing medical marijuana. As states start cashing in on cannabis, Colorado companies are trying to capitalize. New legalized markets mean new opportunities for established companies like Wana Brands. Whiteman says they’ve set up a licensing agreement to sell their products already in Michigan, and have plans to build facilities in other states as well. “We see kind of what markets kind of make the most sense from a regulatory standpoint,” said Green Dragon cofounder Alex Levine. Levine says most Colorado-based companies have to have a good pulse of where markets are leaning for legalization. He says it often comes in gradual progressions, until full legalization. Levine says Colorado companies are uniquely qualified to establish roots in new states. “Colorado operators definitely have the most experience, purely on a time basis, and not only that, a lot of the regulatory systems in other states are actually based off of Colorado,” Levine said. Green Dragon is currently establishing dispensaries in California and Massachusetts, but have sights set on other markets as they grow. “You can’t stop the wave that’s happening right now,” Levine said. “It’s just too much momentum.” But if you’re not in the industry, how can you cash in on the green wave? “The laws haven’t changed, nothing has changed, except for sentiment, but it’s feeding on itself,” said founder of 420Investor.com Alan Brochstein. Brochstein monitors marijuana-related stocks on the market, but says it’s tricky because of federal regulations. Most companies that trade stocks open in Canada, but can be traded in the US with OTC stocks. Because of the volatility, Brochstein says investors should really research the companies and the industry specific trends before diving in. He says stocks in this field used to be very event based, reacting to different announcements of legalizations by a state, but now it’s more reactive to industry partnerships and deals. 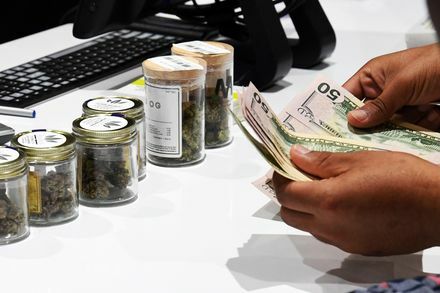 There is a law in Colorado that prohibits outside investment into marijuana companies, which prevents dispensaries like Green Dragon from going public.